JOINT SECURITY AREA -- Since the Ronald Reagan administration, almost every US president who visited South Korea has gone to the Demilitarized Zone, the heavily fortified border dividing the two Koreas, to get a firsthand look at the division and lingering tension of the unfinished Korean War. Wearing bomber-style jackets, visiting commanders have often gazed through binoculars toward the barren strip of the northern land. There, they could visualize what it would be like if another war breaks out on the Korean Peninsula -- for which there is the existence of 28,500 US soldiers in the South. After a weekslong guessing game and a last-minute surprise ruined by heavy fog, US President Donald Trump did not travel to the DMZ on Wednesday as he wrapped up his two-day state visit to South Korea. Having scrapped the plan early in the morning, he spoke at the National Assembly, in “a direct message” to the “cruel dictatorship” of North Korea that the US will maintain “peace through strength” and will not allow the rogue regime to threaten it or its allies with nuclear weapons. Days before Trump’s now aborted plan for a DMZ visit, The Korea Herald traveled to the Joint Security Area within the border zone where soldiers of the two sides face one another only meters apart surrounded by networks of bunkers, military posts and landmines. The journey to the DMZ took about 75 minutes by car from Yongsan-gu in downtown Seoul. It started out right next to the US Yongsan garrison and Hyatt Hotel Seoul, from which Trump’s own trip via helicopter must have started. By helicopter, the travel time would have been a lot shorter. It was this close proximity to the thriving metropolis of Seoul that makes the DMZ feel like a surreal world. Our trip was hampered by little traffic until our vehicle was halted for inspection at the Unification Bridge, an entrance to the “civilian controlled area.” Outside visitors are prohibited from proceeding without getting permission in advance. From there, past several security checkpoints, military posts and historical sites, we arrived at the main gate of Camp Bonifas, home to the United Nations Command Security Battalion of Joint Security Area. Under the slogan of “In Front of Them All,” the UNCSB-JSA is the most forward-deployed unit in charge of keeping security in the JSA -- the only portion of the DMZ where the two Koreas’ soldiers can watch each other’s every move and a must-see spot for foreign dignitaries, such as US Defense Secretary Jim Mattis. 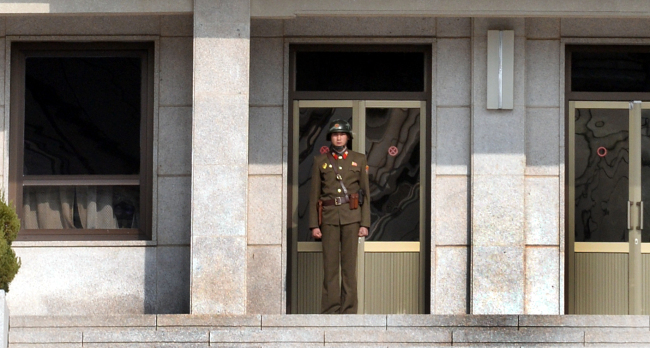 South Korea`s army soldier stands at a conference room inside JSA. Park Hyun-koo/The Korea Herald. 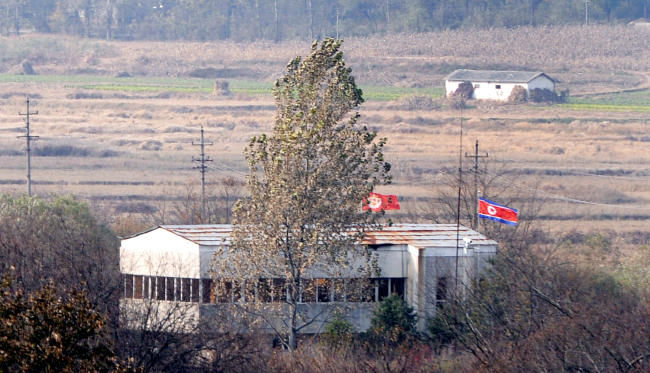 While the South Korean military police stood in “a modified Taekwondo position” behind the blue conference room, a North Korean soldier in a brown uniform looked across the border from the Panmon Hall inside the zone of North Korea. “When Mattis was here to hold a press conference, there were quite a number of North Korean soldiers walking around over there. There was even a group of Russian tourists,” said a UNC official, who accompanied the visitors. Behind the thick curtain of Panmon Hall, however, North Korean soldiers can peek into the South Korean portion with binoculars. There is also rumored to be a recording device designed to film visitors’ activities. That is why the South Korean military police constantly reminds visitors not to point at anything toward North Korea -- or make any gesture that might be construed as provocative to those standing at the opposite side. At the center of the JSA lies a cement-looking plank on the ground that serves as an official boundary between the two Koreas. Located across the border line were several blue conference rooms designed for inter-Korean talks and family reunions. “Now, you are inside North Korea territory. Try not to be dragged to the North Korean side,” The Korea Herald’s photojournalist quipped inside the conference room, where tourists can travel freely. A large dark wooden table with a United Nations flag sat on the line between the two Koreas. In 1997, North Korean soldiers tried to drag a South Korean MP out of the conference room. He fought them off, but now two soldiers must stand watch in the conference room, with one holding the belt of the other to make sure nobody is dragged over to the other side. After spending about half an hour taking pictures and filming the area, The Korea Herald and other media outlets then returned to South Korea‘s Freedom House -- opposite the North’s Panmon hall -- and headed to check out military checkpoints spread across the JSA. The journey began from checkpoint 3, an observation desk where visitors can catch a glimpse of North Korea’s village Kijong-dong. Once designed to symbolize the prosperity of the North, the village has been nicknamed “propaganda village” by the South. Inside the village dotted with empty houses without glass and shells, there was a 160-meter flagpole bearing the North Korean flag. North Korea’s propaganda song reverberating in the air. The sound, however, was too weak to make out the lyrics. Against the backdrop of verdant green forest interspersed with sandy fields, there was a now-defunct checkpoint 4. It is located on the “Bridge of No Return” where the two Koreas exchanged prisoners after the Korean War. The last exchange took place in 1968. Just a few steps away from the observation deck lies a tree stump. It was a remnants of the tree cut down during the Operation of Paul Bunyan, a show of force operation in response to the brutal death of two US soldiers by North Korean soldier’s axes in 1976. The visitors could have landed at the checkpoint 4 until 2016 when South Korea found out North Korea had planted mines inside the DMZ. In August 2015, two South Korean soldiers on a regular patrol lost a leg when one of them stood on a landmine planted by infiltrators from the North. That is why the trip to the DMZ would have been a prime opportunity for Trump to understand the volatility in the region and the potential costs of his warlike rhetoric with North Korea leader Kim Jong-un, according to the US lawmakers visiting the DMZ. 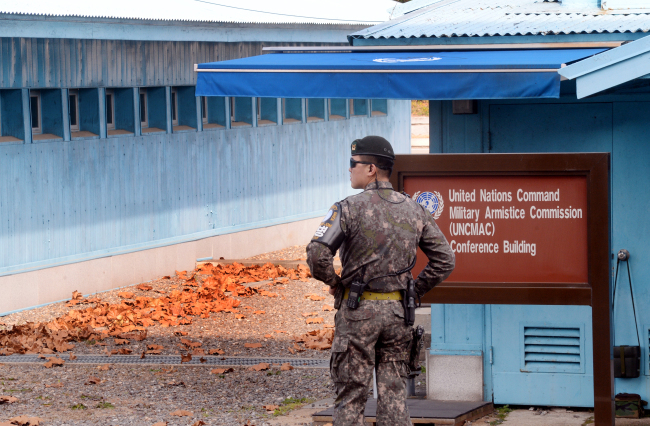 “A trip to the DMZ helps embed the understanding that that is not the case. You attack North Korea, there are huge consequences for South Korea and a huge loss of life.” Democratic Sen. Jeff Merkley said in his interview with US media Politico. “When the president talks about his various ways of threatening the North and uses terms like ‘fire and fury’ ... it conveys an impression that the president believes we have a military route to being able to destroy North Korea with no consequences,” Merkley was quoted as saying.